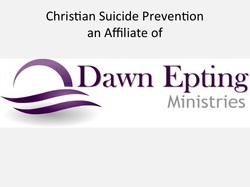 Christian Suicide Prevention an affiliate of Dawn Epting Inc., is a 501c3 tax exempt organization committed to spreading the grace of God and the message of no condemnation! Your financial gifts are tax deductible as permitted by law. Please consider partnering with us to further our cause of saving lives with a recurring monthly contribution. We will mail a welcome packet to you and place your name on our website for your gift. Partners and sponsors will receive a financial statement at the end of the fiscal year outlining all contributions received and expenses. We not only value your financial contributions as a partner, but prayers as well! We are appreciative of your partnership and commit to praying for you on a daily basis. Please contact us if you elect not to have your name placed on this site after contributing. You may also make a one time donation below. Thank you for your support! After clicking on the automatic billing button below, pay securely on the next page by scrolling down and clicking on "Pay using your credit or debit card." Please click "Donate" below. Enter your donation amount on the next page, click on UPDATE TOTAL, and scroll down to "Don't have a Paypal account" on the left hand side if you prefer to contribute using your credit or debit card instead of your Paypal account. Thank you!